To make up new manifolds to suit the installation i used stainless steel 1 3/4" test-bends from a local stainless steel exhaust centre. These were cut into many pieces and mig-welded using stainless welding wire, then the welds were sanded and polished. After fitting the engine i realised that the polishing was probably a waste of time, as the cylinder heads are so wide that you cannot see any of the exhaust manifolds in the engine bay! 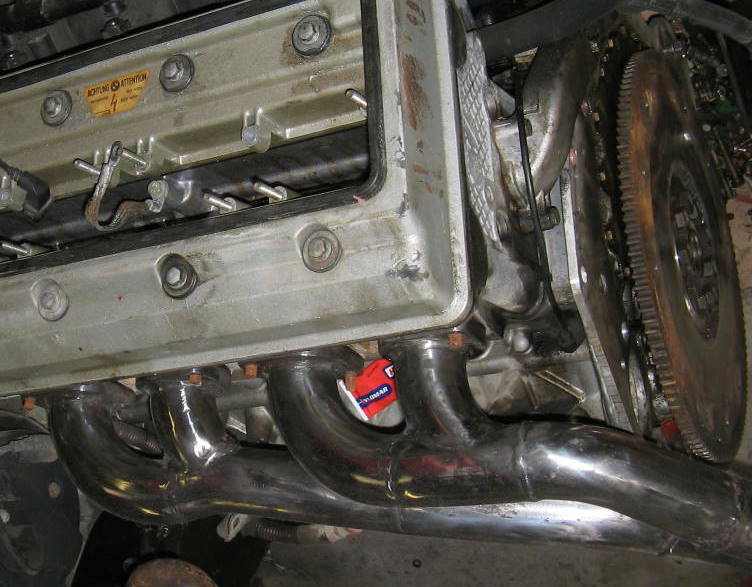 Because of the limited space available between the cylinder head and the engine bay it is difficult to find room for a 4-2-1 design with decent length primaries. But it certainly possible to improve on the design of the original BMW manifolds which have some horrendous kinks and flattened setions right next to the head. It is fair to say that there is more room to play with in the capri engine bay than there is in the BMW shell. I'm sure it would be possible to create a better design than my attempts with longer equal-length primaries but it just depends how much patience and skill is at your disposal, mine ran out after the engine had been in an out of the car about 5 times... Space seems to be the biggest restriction to creating a decent exhaust manifold design on these engines. This side had to run forward to the front of the engine because the steering column was right in the way. It then drops down the front side of the crossmember, and the front pipe of the exhaust system then has to pass underneath the front crossmember. This does make the ground clearance a bit tight with 2" lowered front road springs, and would be better on standard height springs.